Varna's newest hostel! Nearest to the train station, only 200m from the central train station. Set up by experienced traveller. The outside of the building is old and doesn't look too good (it's due to be renovated) but the apartment is new. **NEW** FREE CALLS TO LANDLINES!! CALL HOME FOR FREE !! With WiFi internet access , TV and multimedia systems in the communal area, Single and double bed accommodation, free tea and coffee and much more, we can offer comfortable facilities to suit everyone all in recently renovated apartment. With the city centre 2 minutes walk away and the beach 5 minutes walk away we are within easy reach of Varna's vibrant nightlife, high quality restaurants and bars, casinos, Roman ruins , Turkish bazaar's and fantastic pedestrians shopping areas. PC equipped with skype headset and webcam, printer and scanner. Single and double beds available in the dormitories. TV in the communal area connected to cable tv and a multimedia PC with an extensive collection of english language movies and TV shows. 1 Free glass of beer or wine per day. Friendly English / Bulgarian speaking staff. Cu părere de rău, noi NU SUNTEM un HOTEL de familie. Suntem un HOSTEL cu dormitoarele şi băile âmpărţite. Facilităţile noastre NU sunt potrivite pentru copii. К сожалению, наш хостел НЕ является семейной гостиницей. В номерах одновременно проживают несколько посторонних людей и ванные комнаты предназначены для совместного использования другими постояльцами. Удобства хостела не ориентированы на детей. A létesítmény nem alkalmas a gyermekek számára. Mes nesame seimyninis viesbutis. Musu patalpos nepritaikytos vaikams. Staff can offer extensive first hand recommendations for accommodation and travel across the Balkan peninsula and beyond. 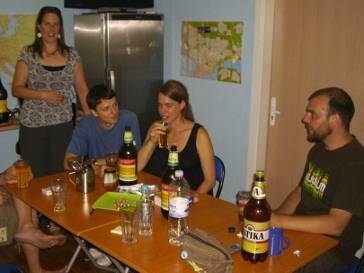 Unlike many hostels in Bulgaria we only offer the facilities and services we can actually provide. Located in the very center of Varna 200M from the central train station. With the city center 2 minutes walk away and the beach 5 minutes walk away we are within easy reach of Varna's vibrant nightlife, high quality restaurants and bars, casinos, roman ruins turkish bazaar's and fantastic pedestrianised shopping areas. 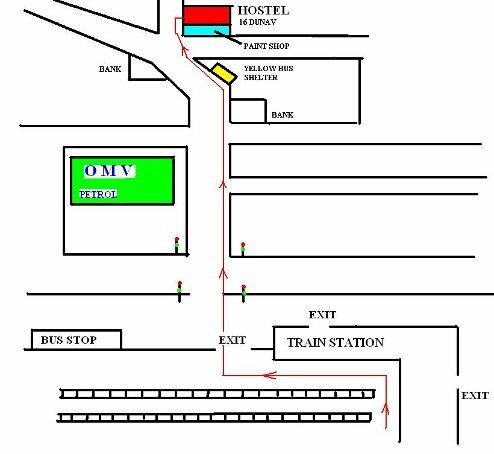 Come out of the main entrance and cross the street towards the OMV gas station and take the side street to the right of OMV (directly opposite the station entrance). Follow the street for approximately 150M. When you reach the corner with the yellow bus stop on the right hand side of the road and the investment bank is to your left, cross the street. The hostel is above the paint and hardware shop. Take the small street heading uphill, the entrance to the hostel is approximately 10M on the right. Follow the stairs to the 3rd floor apartment 9. The outside of the building is old and doesn't look too good but the apartment is new. We do not recommend the taxis here but they should not charge you any more than 10 Leva even in rush hour. We do however recommend the number 41 bus or 22 bus that run from the main street outside the bus station to the train station and then follow the above directions. The bus costs 0. 80 leva, pay on the bus. You need to be on the opposite side of the street from the bus station to catch the buses going the correct way- towards the centre. The main bus station has an OMV Petrol station outside it, you will know to get off at the train station because it also has an OMV Petrol station by it, there are no other OMV stations between the bus and train station. The ferry port for Odessa and many more locations is approximatly 5 minutes walk, if you arrive by sea come out of the ferry port and head downhill then follow the above directions once you reach the train station. Catch the number 409 bus from the airport to the bus station then follow the above directions. If you wish to use a taxi avoid the touts and head for the licensed taxi rank you will pay approximatly 200% less by using licensed cab.